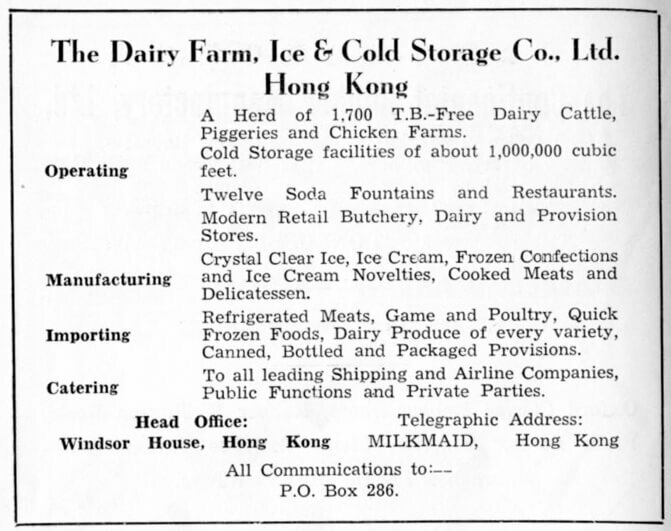 By 1918 (some records say 1916), the original Hong Kong Ice Company joined Dairy Farm and became known as the Dairy Farm, Ice and Cold Storage Company Limited, following the merging of the food sections of Lane Crawford and Dairy Farm. Employees details will be added as information comes in. Troup, Ian Charles Information added 24th March 2018. Lyn Innes: My father’s name was Ian Charles Troup, born in Aboyne Scotland in 1894. He fought with the Gordon Highlanders in WWI and then I find him travelling to Hong Kong to work on a dairy farm in 1919. he left in 1921 (probably August). I am wondering if it is possible to find any trace of him in your archives. The passenger list suggests he was going out as a manager. His family owned a butcher’s shop in Aboyne so he would have been used to handling and storing meat and dairy foods. Chris Beard: My wife’s grandfather Fred Wilkinson, (b 22nd January 1905, Hong Kong), worked for the company from 1929 to 1941. In 1929 when his daughter Joan was born he gave his occupation as Mercantile Clerk/Assistant. He and his wife, Beatrice Wilkinson, and all their children were interned at Stanley camp in January 1942 during the Japanese occupation in WW2. At that time Fred was again listed with the same occupation. He got his old job back in 1948 when he returned to Hong Kong. This article was first posted on 16th February 2017.